how fun are these?!? 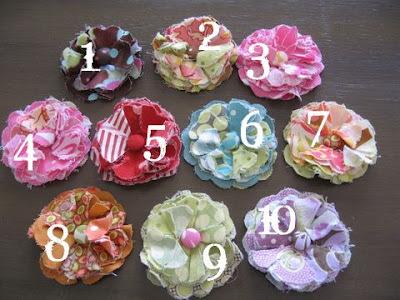 i made some fabric flower brooches like these a few years ago as favors for a baby shower i hosted for a friend. this time i used really fun fabrics in lots of combinations. you like? the tank above with the 3 flowers may look a little busy, but its really fun on. but here’s a slightly subtler version. for the flowers on the frame i just used packing tape and made a small loop on the back of each flower and slapped them on. here’s a fun way to dress up a bag. each flower has a pin clasp on the back. but i think it looks even cuter with three flowers! although this picture is terrible, picture how great these would be on a vintage coat, a sweet cardigan, or even a plain t-shirt. they are $5 each or 3 for $12. shipping is $2.50, and 1$ for each additional item you may want to add from here. UPDATE: #’s 1, 2, 3, 4, 5, 6, 7, 8 and 9 ARE SOLD. 11 comments for "flower brooches"
so fun! if you want to get to know me a bit better, run on over to flipflops & applesauce for a fun little interview chrissie did with me! if you haven’t been to this great blog and you’re a mom, dad, grandparent, baby sitter, or just like kids, stop by and say hello and get a wealth of great ideas from this new blog. 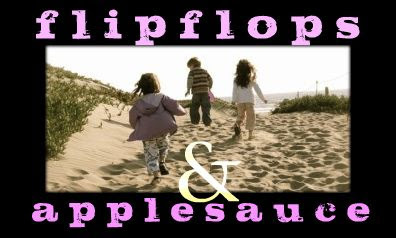 6 comments for "flipflops & applesauce"